A stewardess of a Pobeda (Victory) airline's plane at a city airport, Volgograd. Lowcoster airline Pobeda (part of Aeroflot Group) introduced new international flights to Azerbaijan (Baku) and Georgia (Tbilisi). According to the press service of the airline, by the end of the winter schedule there are at least 30 percent of the tickets on the new routes for the minimum rate - 999 rubles ($16) including all taxes and fees. 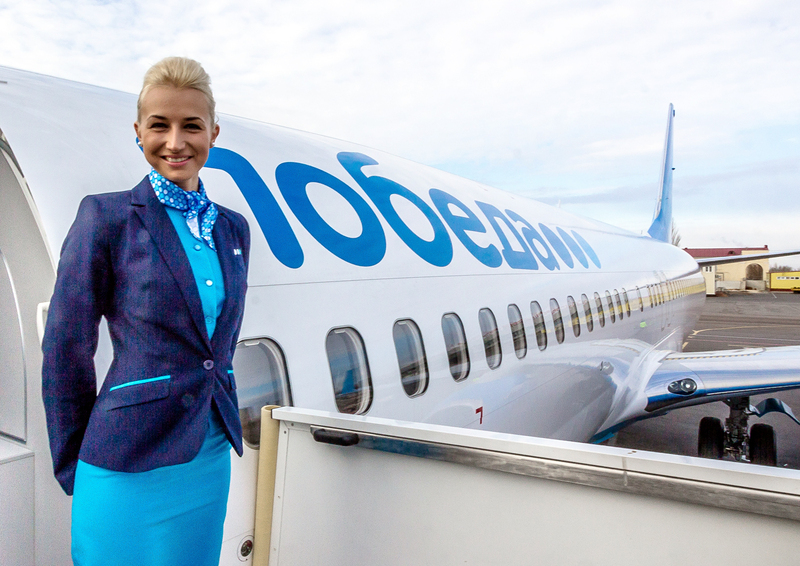 Pobeda will conduct flights from the airport of Rostov-on-Don to Baku starting from Oct. 30 four times a week, to Tbilisi - from Nov. 1, three times a week. In the fall, the airline is planning to double the program of flights from St. Petersburg, adding flights to Astrakhan, Volgograd, Vladikavkaz and Nalchik. In addition, the company will open flights from Ekaterinburg to Krasnoyarsk and Novosibirsk. In July, a source told TASS that Pobeda might open four new international destinations from Rostov to Yerevan, Baku, Tbilisi and from Samara to Almaty before this fall. Pobeda is a part of Aeroflot Group and operates on a classic low-cost carrier (LCC) model. Company’s fleet is formed by Boeing 737-800 Next-Generation (NG). By 2018, the company plans to increase its fleet up to 40 units. It is expected that by this time the company will carry over 10 mln passengers. The company’s route network will include 45 domestic and international destinations.